Join Staunton State Park’s experts as we discuss everything you wanted to know (but were afraid to ask) - about Ground Hogs. 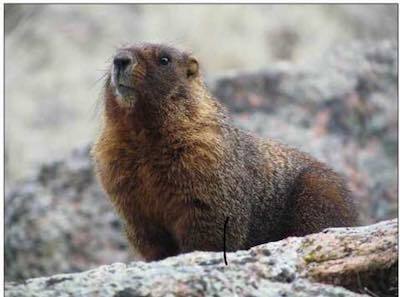 Including Staunton’s park mascot, the Yellow Bellied Marmot. Meet at Staunton Ranch Trail and the intersection with Mason Creek Connector Trail - just above the new parking lot. Cost: $7 for park entrance, program is free! May Visitor Programs and Hikes! Learn how to take breathtaking photographs! Bring your own camera for a short instructional class and then hike with a photographer along the beautiful trails to use your new skills to photograph the many wonders of Staunton State Park! Come and enjoy Colorado’s Public Lands! Interpreter’s Tent “Growing Up Bear” Come visit the Interpreter’s Tent at Staunton Ranch Trail Head and find out how bears spend their first year! 10a-2p Fish are hopping at the Davis Ponds (stocked with Rainbow trout) as well as Elk Pond (Brookies everywhere!)! Poles and bait can be borrowed for the day at Davis Ponds. Those 16yrs and older must have a valid Colorado fishing license. Jr Ranger Program starts in June! This program is designed for children to enjoy an independent experience and gain knowledge of the outdoors. Parents are invited and encouraged to attend the final day graduation event. Each session includes a three day program held Wed. Thur. 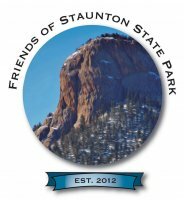 Fri. 12noon-3:00pm Sign up on-line at the Staunton State Park website (link below in signature) or at the Park Entrance. Summer Hours are now in effect - Staunton is open from 7:00am to 9:00pm every day! Last edit: 01 May 2018 16:32 by FriendsofStauntonStatePark. Tomorrow is the next Wildlife Photography Hike - meet at the Ranch Hand Group Picnic Area to begin! It will be a busy weekend at the park so carpool if you can and try to get here early (current hours are 7am-9pm). Please remember that a portion of Mason Creek Trail and the Lions Head Trail are closed to hiking for wildlife conservation. Happy Memorial Day Weekend to you all and especially to all who have served, or lost a loved one who served, our great country. Fish are hopping at the Davis Ponds (stocked with Rainbow trout) as well as Elk Pond (Brookies everywhere!)! Poles and bait available for use at Davis Ponds. Those 16yrs and older must have a valid Colorado fishing license. Join Colorado Parks and Wildlife for a weeknight evening of fishing fun. 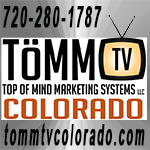 Instructors will provide equipment and instruction on bait, spin, and fly-fishing a Colorado high country lake. Later in the clinic, we will show how to prepare fish in the field and even cook some fish up to sample. This clinic is for anyone new to bait, spin, or fly-fishing. Participants 16 years old or older are required to have a valid fishing license. Parents, be sure to buy that license so you can enjoy fishing right alongside your children. There is no charge for this clinic, however vehicles will require a valid State Park Pass. Participants will meet in the first parking lot on the left just past the entrance station. There will be a gentle hike (just under 1 mile) from the parking area to the pond. Please bring water and clothing for the weather conditions. You may take your own fishing gear or use ours. July Visitor Programs and Hikes! 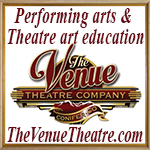 Each session includes a three day program held Wed. Thur. 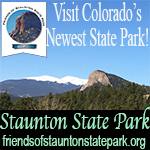 Fri. 12noon-3:00pm Sign up on-line at the Staunton State Park website or at the Park Entrance. August Visitor Programs and Hikes! September Visitor Programs and Hikes! Its that time of year! The male elk, deer and moose are battling to win the loyalty of a “harem” of females. Listen for the bugling and grunting noises of the RUT! Last edit: 30 Aug 2018 20:32 by FriendsofStauntonStatePark. 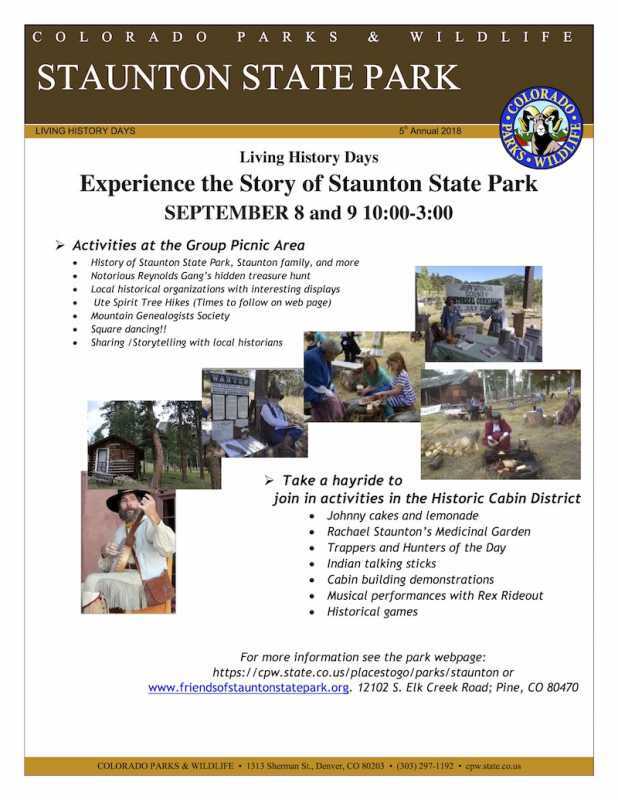 Today and tomorrow at Staunton State Park, it's Living History Days! October Visitor Programs and Hikes! The leaves are changing and the mountains look amazing. Come visit and discover how and why leaves change their colors in the fall! As these masters of the sky soar high above us, come learn close up about the features that make them so amazing. Fishing equipment, including bait, available to borrow for the day. Pickup at the Interpreter’s Table near upper parking lot. Fishing equipment including bait available to borrow for the day. Pickup at the archery range near the upper parking lot. Hike or Treat, Smores and More!! Come enjoy a fun hike on Davis Ponds Trail around Pookah Loop! Meet the creatures of the mountains and gather up yummy treats! Think bats are scary? Then you don’t know bats! Come find out how these interesting and intelligent creatures actually help humans! Fishing equipment, including bait, available to borrow for the day. Pickup at the Interpreter’s Table at the Group Picnic Pavilion parking lot. Give Thanks for the Great Outdoors! Colorado Parks & Wildlife encourages you to take some time this Thanksgiving weekend to explore the outdoors and make new memories with the people you love. Turn Black Friday into a blue skies Friday, a green trees Friday, a white snow Friday… a Fresh Air Friday! Every outdoor activity is the right way to celebrate Fresh Air Friday, whether exploring a state park, skiing in the high country, or playing a game of freeze tag in the backyard. Studies show that spending time outdoors - no matter the activity - can improve one’s ability to focus, decrease fatigue and even help improve short-term memory! So whatever activity you choose, get out and give thanks. Snap and share your outdoor adventures with us using the hashtag #FreshAirFriday​ on Facebook, Twitter or Instagram. 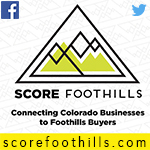 Colorado Parks and Wildlife is pleased to partner again this year with Great Outdoors Colorado (GOCO) to offer free access to all 41 Colorado state parks on Fresh Air Friday. Throughout the year, CPW offers family-friendly activities, fun-filled adventures and opportunities to learn and try new things at all of our state parks. We look forward to your next visit! Find a Fresh Air Friday event near you! !